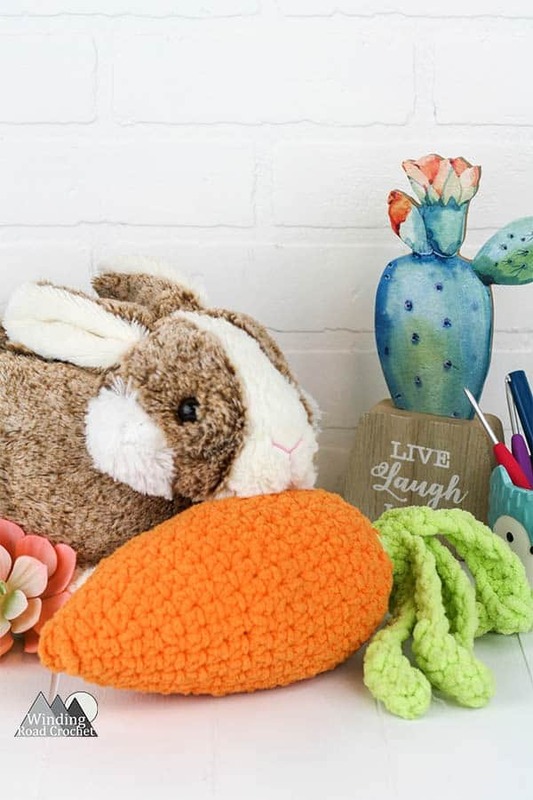 The Crochet Carrot Photo Prop is perfect for spring and easter photos or as a fun oversized garden stuffed toy. This is an easy free crochet pattern that works up quick. This carrot will also make a great Easter decoration along with the Easter Egg Plushie. You can definitely make this carrot smaller by using a thinner yarn and smaller hook, but I just love how quick the Bernat Blanket yarn works up. I made this pattern last year and I am not sure exactly how much yarn it uses, but this crochet carrot does not use very much. To make this crochet carrot we will be using amigurumi techniques and working in the round. The carrot is worked as one piece and stuffed before working the last few rounds. This pattern is available for free on my website, but if you prefer to work from a printed copy, I have taken the time to make an ad-free printable version of this pattern for your convenience. It can be purchased on Ravelry. This crochet carrot makes a great photo prop, but my children also like to use it to ‘feed’ to their other stuff animals. It can be made with a smaller yarn and used as fake food in make believe play or to stock a crocheted garden. MC- Magic Circle – Learn my easy technique for the Magic Circle. Stretched out the crochet carrot measures 14 inches. Note: This is the perfect time to stuff your carrot with Polyfil before continuing on. Change Colors to Green yarn. Note: In the next row you will create a chain then work stitches back along the chain to create the fronds of the crochet carrot. R20: *Ch12, Hdc in the second Ch from the hook, Hdc in the next Ch, Dc in the next 3 Ch, Hdc in the next 2 Ch, Sc in the next 3 Ch, Slst to the next St of Row 19* repeat from *to* a total of 6 times. Your last Slst will be to the base of the first Ch 12 made. Fasten off leaving a long tail. Use this tail to gather up and sew together to top of the carrot. Your crochet carrot is complete and ready to replayed with or used in photos. Are you going to make a Crochet Carrot Photo Prop? I would really like to see your finished piece, take a picture and share it with me on any social media! Just tag me @windingroadcrochet, #windingroadcrochet, or #ourcrochetjourney. Join my Facebook Group and share your creation with the community at Our Crochet Journey Facebook Group! Written pattern, tutorials, graphs and pdfs of the Crochet Carrot are copyright Windingroadcrochet.com. Please do not reprint or repost this content as your own, but please feel free to share this link with others. You can find more information on sharing my work with others in the Terms and Conditions Page.